The group formed June 15th, 1993. Today’s members consist of founder Bob C. (Keyboard ~ Guitar ~ Vocals), Theron J. (Keyboards ~ Vocals), Bryan W. (Saxophone ~ Horns ~ Vocals), Ed A. (Percussion), Troy C. (Bass), and Joe Y. (Bass). 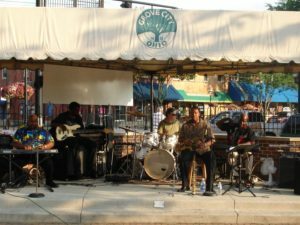 The group has played various festivals, such as Grove City Summer Sizzle Concert Series, the Franklin County Fair, and Arts in the Alley. Bits and Pieces has appeared on television multiple times, and done work for corporations such as The Kroger Company. The group plays local venues all over Central Ohio, and has performed live for wedding ceremonies and receptions.